At least once a month, my friend John sends me a picture text message around lunchtime with various captions. "Mmmmm . . .wish you were here!" 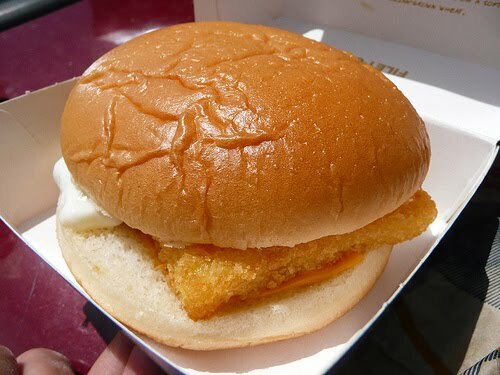 His written message is always different, but the picture, of a McDonald's Filet-O-Fish sandwich, is always the same. Yes, that's what I wrote: A Filet-O-Fish sandwich. From McDonald's. The first time he sent me this picture, which is now an inside joke between us that has been going on for years, I was confused. Why is John sending me a picture of his lunch? 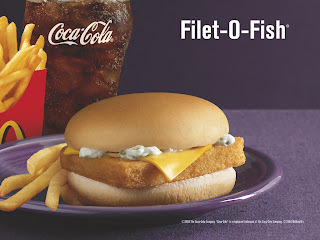 And, more importantly, why the hell is he eating a Filet-O-Fish? Our friendship has evolved over the years, and so has my understanding, or at least acceptance of his feelings about the popular McDonald's menu item. He loves it. He craves it. Since he tries to abstain from eating meat during Lent, he may eat it upwards of once a week sometimes. I'm a seafood snob as it is, refusing on occasion to eat fish at the nicest restaurants simply because I was in a landlocked state; eating seafood prepared in a deep fryer at McDonald's is almost too much for me to even think about. I've turned up my nose at John's decision to eat the Filet-O-Fish so frequently and with such gusto, but my judgment was based on nothing. I'd never actually tried it, so how did I know if it was as disgusting as it appeared? John pointed out to me that for someone who claims she's open to trying new things, refusing to try the Filet-O-Fish is really not fair. So on Day 340, I decided to table my judgment, if for only an hour, and try a Filet-O-Fish from McDonald's as the thing I've never done before. I sent John an email that morning with the subject line, "Filet-O-fish?" And I said, "Yeppers. 12:30pm in the parking deck." John never asked, but if he wondered why on this day I decided to put aside my strong adverse opinions about the Filet-O-Fish long enough to give it a try, I'd have to admit there really wasn't a good reason other than I had the time to go to lunch with him, and, thanks to Whynatte, I would've eaten anything so long as it was battered and deep fried. The stars had really aligned in favor of the Filet-O-Fish. I met John and our friend Kim in the parking deck and we walked to the downtown Atlanta McDonald's. I laughed as they weaved in and out of traffic, through parks and on sidewalks I'd never seen before; they walked with purpose as if we were headed to claim some grand prize, and the prize was a McDonald's value meal. This was the first time I could remember ever being out in downtown Atlanta at lunchtime; I had no idea there were so many people out and about. Business people, elderly people, homeless people, kids and parents filled the streets. The same people filled McDonald's too. The restaurant was packed and loud. There were adults shouting, kids crying, homeless people talking nonsense; perhaps everyone was interested in trying the Filet-O-Fish that day. The lines to the registers were long and didn't seem to be moving very quickly. John, Kim and I got in what appeared to be the shortest line and observed the insanity going on around us for a little while. I told them about my regrettable encounter with Whynatte the night before, and Kim confirmed that she really is the busiest person in Atlanta. When the line we were in didn't really move after 15 minutes, we considered either changing McDonald's, or going somewhere else entirely. Thankfully, Kim and John knew I had a mission to accomplish and exercised patience, but none of us could ignore that we were witnessing truly some of the most inefficient employees we'd ever seen. 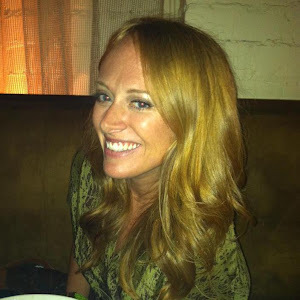 A manager jumped in to help expedite the process, but the lines still just creeped forward. The slow-moving lines allowed John to share the story about how the Filet-O-Fish was created. According to him, a franchise owner in Cincinnati came up with the idea for the fish sandwich after suffering low sales during Lenten season from the heavy Roman Catholic clientele who didn't eat meat on Fridays. His idea got entered into a contest against another man's idea for a grilled pineapple sandwich. 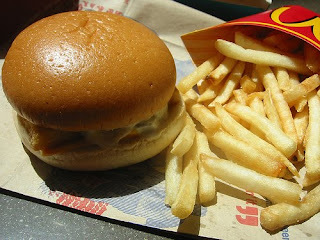 The rules of the contest were that whoever sold the most sandwiches on a particular Friday would have their sandwich idea added permanently to the McDonald's menu. The Filet-O-Fish won in a landslide. I checked John's story to see if what he was telling me was factually correct, and short of a few details, it was. 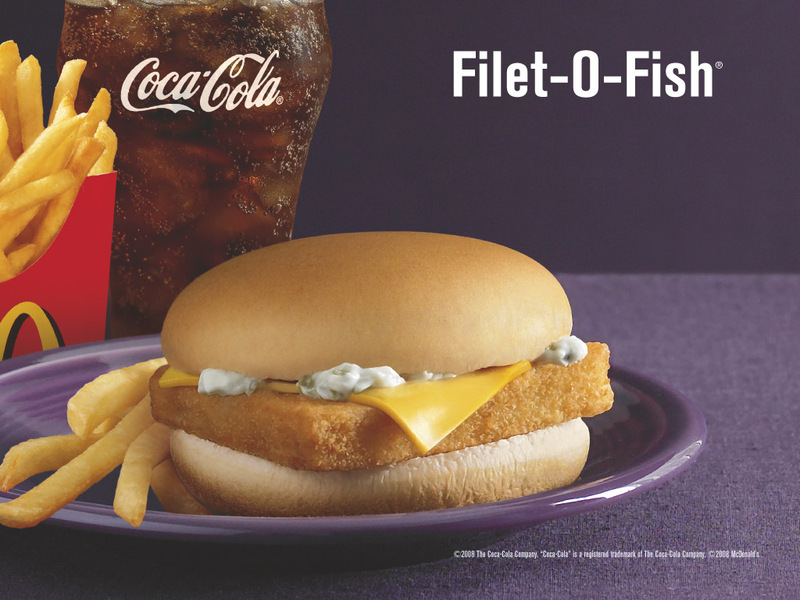 Here's the real Filet-O-Fish story. I don't know how John knows this much information about all of the food that he eats, but his little anecdote helped kill time before it was time for me to order one of my very own. I both proudly and reluctantly ordered the Filet-O-Fish value meal. The three of us sat down next to a window and out of the chaos. I unwrapped my sandwich and fries, and laughed that everything I was about to eat was golden brown, fried to perfection. Regardless of how it tasted, there was no denying that this meal was the exact opposite of the colorful food nutritionists encourage people to eat. John picked up his sandwich and showed me that he went for the double fish filet, so he had two fish patties on his bun. The smile on his face could not be tamed, and he happily dug right in. Kim opted for a Happy Meal, apparently as scared as I was by the idea of fried fish from McDonald's. I guess she'd prefer to be scared by the scary dolls that they are putting in Happy Meals these days. She gave me the doll and I've kept it at my desk since that day as a reminder of our little outing. With nothing left to do or talk about, I picked up the sandwich and took a bite, unde r the close watchful eyes of John. I find eating in front of someone who is waiting for a response terribly awkward. They are waiting for you to react or say something. I chewed slowly and smiled at him, trying to find the words to accurately capture how I felt. Nothing came to me. I wasn't utterly disgusted like I thought I would be. But my world didn't really change for the better either. I can say that all of my negative commentary about the Filet-O-Fish was misguided and unfair. In facet, I don't know that it's worth so much attention, positive or negative. I mean, it's a fish stick on a bun for goodness sake, with tartar sauce and a slice of cheese. I'm not sure I understand the cheese, and tartar sauce in general kind of sicks me out if I think about it too much, but I ate the whole thing. I'm quite certain that had nothing to do with the Filet-O-Fish, though; I would've eaten just about anything deep fried on that day. I support John and would be happy to accompany him to McDonald's anytime he needs a fried fish fix. But I think I'm going to have to keep any of my fish purchases grilled and not served in a cardboard box. If that makes me a snob, then so be it. hahaha. so funny, but also really sweet he that is so consistent about the lunchtime photos!